Originally launched in 2013, Fume has positioned itself as a market leader in relaxed restaurant dining in Dubai. The restaurant’s concept is laid-back, home-styled comfort food from all over the globe. All dishes are meant to be shared, and are brought to the table when ready rather than as a set course. Their first outlet is in Pier 7 (which BBC Good Food Middle East visited), and the newer venue is in Downtown Dubai which launched last year. What were the food highlights? 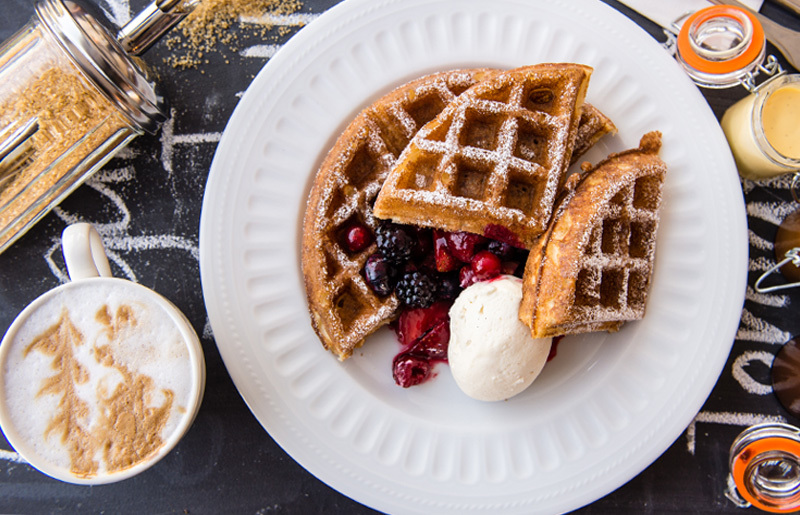 The ‘Waffles with mixed berries’ dish was incredibly fresh and great to share between two or four people. As is to be expected with a breakfast menu, egg dishes featured heavily – which was no bad thing – the ‘Salmon with eggs & eggs’ and the ‘Arabic breakfast’ with shakshuka and poached eggs were both cooked delicately and to a high standard. The staff were friendly, relaxed and incredibly attentive. One member of our party felt cold and the staff were on hand to offer her a pashmina. Moderately busy, with a mix of expat families with young kids, and groups of 20-somethings. A sharing concept with staggered service might seem like an odd proposal for a breakfast menu, but in practice, it worked well. It meant that the breakfast was at a slower, more leisurely pace than many venues. Overall, Fume is a great place to while away a lazy weekend morning with friends over coffee and good food, or for breakfast with the kids (they have a children’s play area to keep them entertained). The breakfast runs Friday and Saturdays, 9am-12pm. Around DHS 250 for two people dining.